Sub:- SE-SCERT. 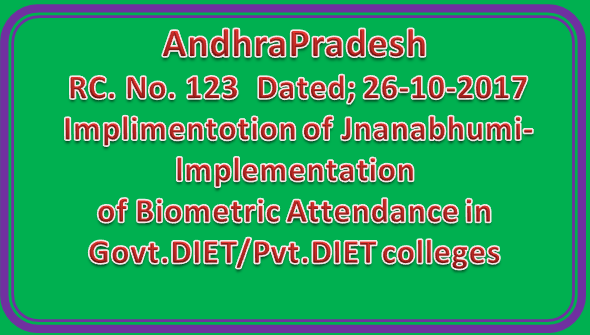 A.P.. Amaravati —Implimentotion of Jnanabhumi-lmplementation of Biometric Attendance in Govt.DIET/Pvt.DIET colleges in the state- Reg. 2. G.O.Ms.No.103 Social Welfare (Edn.2) Dept., Dt.24-10-2016. In the reference 2nd cited, the Government have issued operational guidelines on implementation of JnanoBhumi, the integrated system for Education and Scholarships. In This connection, the Hon’ble Chief Minister has lunched the logo of Jnonobhumi, the smart portal for Education & Scholarships on 30th May 2017 and the portal was made live w.e.f. 9th June 2017. Further vide reference 1’ cited read with para 7(d)(2) of reference 2nd cited, the maintenance Fee (MTF) will be released on a monthly basis to the eligible students belongs to the SC.ST.BC,DW and MW categories, having 75% attendance during the respective month/s. In view of the aforementioned and as directed in pora 5(111) (b) of the reference 1 cited and also as directed in para 7 (D)(1) of the reference 2nd cited , all the Educational Departments in the State. Vis-à-vis. Higher Education .Technicol Education, School Education and other/all the concerned Head of Departments/all the Affiliating Authorities were requested to implement the Daily Biometric Attendance (DBA) on the daily basis in their respective educational institutions, integrated to JnanaBhumi Scholarship portal, for the release of monthly MTF. at an early date. In this Regard all the Principals of Govt.DIET’s and all the principals of Pvt.D.EI.Ed colleges in the State are requested to procure Bio-metric attendance devices in their colleges, hence-forth duly tracking with the Govt,DIET and with the O/o DEO concerned in their respective districts and integrated the same with Jnariabhumi scholarship portal immediately and submit complaint in the matter.